At SHARONS SUGARCRAFT we produce high class quality WEDDING, CELEBRATION and BIRTHDAY cakes made to order. We also produce HANDMADE BELGIAN CHOCOLATES ranging from flavoured chocolates to wedding place settings and favours to chocolate bars of various flavours. 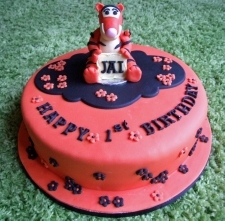 Whether you have your own ideas or require help and advice in designing your cake we offer a free consultation service. This can be by phone, email, letter or in person, at a time to suit you. 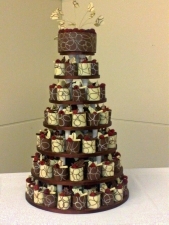 As each cake is individually designed and made, at least 3 months notice is preferred for Wedding Cakes. Although it may be possible to meet your needs at shorter notice - please contact us for advice.